XD The title sounds way more ominous than it should. I’ve mentioned before that I am planning on moving in the near future, and the thought of safely packing and traveling with all my dolls is daunting. Currently, I have five Neo Blythes, 2 licca chan dolls, and 2 hujoos (yosd and super tiny). My dolls are a source of comfort for me – a fun and simple outlet for me during times of stress or melancholy. I know for sure that I will be taking my dolls with me, as opposed to having them shipped, so I started thinking about which of my dollies were indispensable to me. By the process of elimination, I’ve decided to try rehoming Rory, my Hujoo Nano Rabi, and my pink haired Licca chan. If you’re interested in any of these girls, please send me an email at olivesbeauty@gmail.com and I will send you the listing link. Hujoo nano Rabi – comes with faceup, eyes as shown, and a knitted sweater of my choosing. Listed on eBay for $56 shipped. Rory – fake base doll with real Didee Eureka scalp. She has some eye mech issues (the mech was broken then repaired, the eyes change well except on the brown side facing chips), and she has a scratch on her left lid painting. Her fake body has rubbery legs. Listed on eBay for $105 shipped. Licca chan – Merry go Round licca chan with a different body than her original. Her body is a non tilt neck licca body that says Takara China on the back. There are some marks on her legs, but they’re quite faint (I haven’t tried removing them). $25 shipped. It’s weird! My shelf will now only have four neos and one licca chan (and the yosd Hujoo in my closet). I kind of feel less pressure when thinking “how will I take them all?” I’m also glad that I held back on purchasing all the dolls in this year and a half I’ve been in this hobby. I was both productive and unproductive this weekend. I was unproductive in that I cancelled a kind-of important appointment I had, because my work week was really something. I was dealing with a lot of emotions and unexpected events caught me off guard and really, I just wanted a weekend to myself – a weekend where I didn’t have to follow a schedule or plan around anything in particular. I was productive in that I did two major things – I bought some sharpies and a pack of shrinky dink paper and made a ton of stitch markers, and I got around to giving Tsukki, my Hujoo Nano Rabi, a face-up! It was through this podcast that I had the sudden urge to try making things out of Shrinky Dink and dying my own yarn! I haven’t gotten around to the yarn dying yet, but I’ve been making stitch markers out of shrinky dink paper all weekend long. These drawings are all traced, as I wanted to make sure that my stitch markers came out cute. I had a ton of fun with this!! Even watching the pieces bake in the oven was entertaining. I think I might make a little pendant as a blythe pull charm to add to one of my girl’s pull rings. Oooh, maybe a little fox or deer for Elowyn. The possibilities are endless. It’s been a while since I’ve done a face-up of any kind, but I’m happy with how Tsukki turned out! It’s a bit simple, but I think he came out cute. I wish my lines were cleaner though. I also settled on the pinkish taupe eyes for him, instead of the sparkly dark navy blue. I thought the color of the dark blue eyes was hard to see, and the eyes looked less striking. I also really like the mesh pattern of the taupe eyes. And now I’m exhausted, and will be playing the game Stardew Valley or my new 3DS game, Bravely Second, until it’s time to turn in for the day. This is a Janus cat. This is the Hujoo Janus Gato. He arrived from the Junky Spot, and so quickly too! I picked him up today at the post office and deboxed him. I was really surprised by how big he is! He’s about 12 inches tall, which makes him about as tall as a Blythe, but because of his proportional body, he seems so much more substantial than my other dolls. He has two faces, one cat face, and one human face, and this doll was one of the very first strung bjd-style dolls I had wanted a little less than a year ago. Straight off the bat, I noticed some quality issues with the doll. He had a nick on the top of his head where his face plates meet and another one on the side of his chest. Now… I was upset when I saw it, but not so much anymore. Let me explain – it took an hour for me to pry his damn head open. I have to say, between this Hujoo Janus and my Hujoo Nano, Hujoo dolls have got to be the worst in terms of opening up the head. I even googled “how to open Hujoo Janus head” to see if I was doing something wrong. I guess this sculpt is either rare or unpopular, because there aren’t many references to it outside of the Hujoo official company website and maybe one or two blogs. My hands are killing me right now, between yesterday’s arm transplants and today’s head opening. Like the Nano Rabi, the Janus Gato’s head is also held together by these plastic pegs. To open the head up, I had to pry the head open little by little with a tiny flat screwdriver (covered in layers of tape), and slowly work it open. I did a lot of pulling at first (to no avail) to try to avoid using the screwdriver, but I didn’t think I had much of a choice after a certain point. When I was able to get the head open, I found I didn’t care so much about the little chip at the top of the head, seeing as how I made a couple of my own pry marks at the bottom of the head. I sanded off the small nicks with very fine sand paper, and I’m relieved they aren’t noticeable. I have also come to terms with the fact that once I install the eyes, do the faceups, and push the head plates together again, I may never ever open up this guy’s head ever again. Ever. The seller is KOK Doll Collection on eBay, and I’m undecided what size eyes to get (waiting for the seller to send me a new invoice with combined shipping). The Janus Gato calls for 14mm eyes, so I might ghet the purple/grey eyes in 14mm, and the green/gold eyes in 16mm for his cat face plate. I want there to be more color than white part (woo science words I don’t know) for his cat form eyes, so please correct me if I’m wrong to size up >_<. He doesn’t have a name, but I’m leaning toward Felix or Mamoru. XD Here are my doodles done in my Hobonichi Techo. My inspiration for this doll is the maneki neko. He will be a maneki neko spirit. Kind of in the same family as the nekomata and bakeneko, his character will be a spirit in the form of a cat, but unlike those two, he’s a benevolent being. I’m not sure that Japanese folklore views the maneki neko as a spirit, but rather a symbol of good luck with an origin story. He comes into existence because the energy and hope for the statue of the cat to bring luck and good fortune and its use as a symbol has brought about the birth of spirits associated with that symbol and all it stands for (not a naturally existing spirit, but one born by necessity of the people). I may still get him red eyes, but I’m undecided. A white maneki neko symbolizes purity, happiness, and good luck. He needs a red or green bandana for his neck, and either a collar with a bell or a necklace with a bell. I might dress him in a raglan style white top with grey sweatpants, and also attempt to make him a kimono. Funny enough, his cat face is the face that inspires me more! I’m excited to start his faceup, but I might do some more sketches to get a better idea of what I’m going to attempt. Did I say I was on a No-Buy? Apparently, I must have been mistaken. On particularly trying days, I find myself browsing eBay, etsy, and sales group on facebook for good deals on doll clothes and dolls. I think of it as window-shoppng. I’ll cave every once in a while on a new outfit, but I’ve been pretty good about not making any big doll purchases (I don’t really count my Hujoo Nano Rabi because of how small he is, and with shipping, he costs the equivalent of 3 lunches… Priorities, amirite?). This morning, I decided to check my Promotions folder in Gmail (mostly to see if Knitpicks or Michaels had a good promo code up), and I saw a newsletter from the Junky Spot saying that they have the Hujoo Janus Gato in stock! Both photos are from the Junky Spot website. I had the doll in my cart for about five minutes, before I pulled the trigger. I’ve actually first saw the Hujoo Janus Gato when I was researching anthro cat bjds. I really liked the look of the doll’s face(s) and body, and I thought it was super interesting that the head had two faces on it – a mostly cat face and a mostly human face. The cost also priced it way under most of the resin anthro cat bjds on the market. However, at the time, the only place I found that I could order the Janus Gato was on the Hujoo website, and I didn’t want to pay a lot for shipping from S. Korea. So, I proceeded to put this doll out of my mind, as I had come to terms with the fact that I would probably never own it. Imagine my surprise when I saw the doll’s sweet mug(s) in an email! Now, I’ve mentioned that I didn’t think I was a very good BJD owner, because of a few reasons. I guess I felt overwhelmed with all of the extra things I felt I needed to buy, but knew very little about, and also I was afraid of yellowing and the idea that the doll would lose value for simply being exposed to light or age. The only BJD I’ve ever owned, a DearMine Dorothy Anthro cat girl, spent 98% of her time with me in a box in a closet. 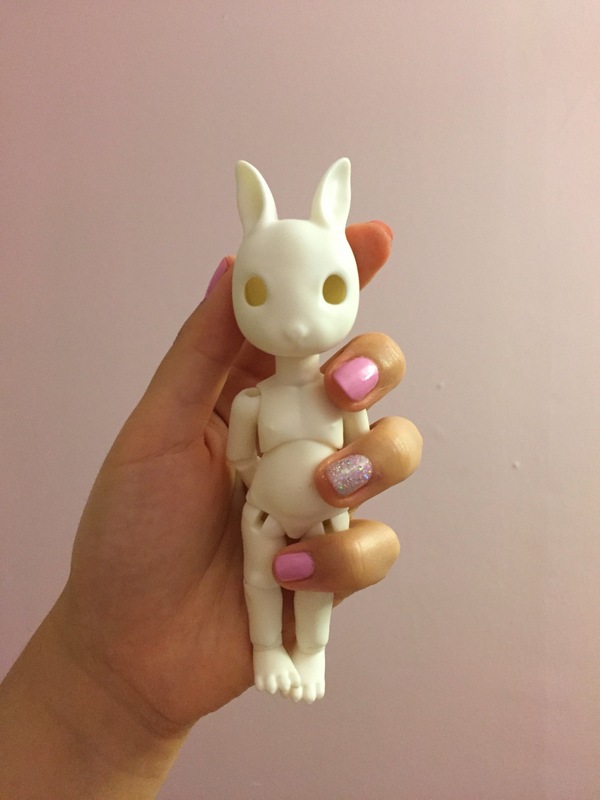 I think things will be different with the Hujoo Janus Gato, because the doll is made of ABS plastic and also while not cheap, it’s nowhere near as expensive as a resin bjd. I also don’t have to worry about wigging this guy because of his unusual head. I also already have a character planned for him, which I will go into when he gets here ^^ (already shipped, Boom!). Sooo, for the next month or so, I shall be packing my lunch. The newest addition to my family has been laying patiently in his plastic wrap, waiting for a faceup, eyes, clothes, and a name. I’m going to wait until he’s all put together before naming him, but I’m leaning toward Tsukki right now, after Tsukushima from Haikyuu!! And a sort of play on words because Tsuki is the Japanese word for Moon, and in Japanese folklore a rabbit is said to live on the moon. Ebay – Smaller selection than Etsy, but I’d still search the above key words. I kind of wanted this little rabbit to look a bit dapper, like an Alice in Wonderland White Rabbit-in-training, but I guess this kind of style is hard to come by in a scale this small. I don’t really want to put him in a t-shirt, and I also don’t want to stick him in a dress, so I ended up combing the internet for knitting or crochet patterns. I’m quite happy with my handmade result! I worked off of this specific pattern, but I modded it a bit. I’m thinking I might sell these sweaters in my store ^^. Hopefully, the next time this guy makes an appearance on my blog, he’ll be more put together. My Hujoo Nano Rabi came in the mail today! I ordered this doll from the Junkyspot on Friday afternoon, and received it today (so quick!). I’ve decided that he will be a boy rabbit, kind of like a rabbit spirit/sprite. I need to find him a white collar shirt with a black ribbon neck tie. No pants for this rabbit though, a la Winnie the Pooh or Donald Duck. ^^ I’m planning on working on his faceup this weekend. I ordered two pairs of glass eyes for him from eBay (many thanks to Chrissy of Kicky Resin), but since those are shipping from China I don’t expect them to get here for another few weeks. Not my photos (I took them from the listing I purchased on eBay).They’re both 12mm eyes from the seller Mybayer2008. I wasn’t sure what color I should go for, so I purchased the two pairs that I liked most. I really like the netting pattern on the taupe eyes. I’m very excited to see my rabbit on completion!